Product prices and availability are accurate as of 2019-04-21 12:40:10 EDT and are subject to change. Any price and availability information displayed on http://www.amazon.com/ at the time of purchase will apply to the purchase of this product. 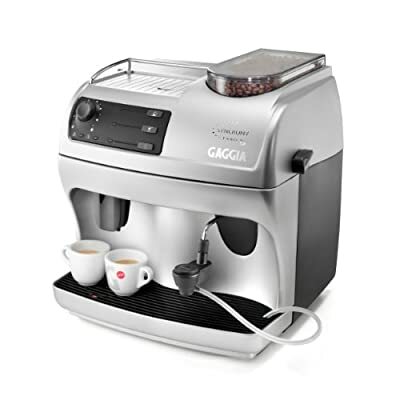 With high-end features such as Rapid Steam, which allows you to switch between brewing and frothing with no wait time, the Logic gives you the ability to produce café-quality espressos, cappuccinos, and lattes easily. When you press the brew button, the Synchrony Logic will grind, tamp, and brewing your delectable drink automatically. It features a volume dial to let you customize how much coffee you’d like to brew, and adjustable dosing from 6-9 grams to brew at just the right strength. And with the Logic’s Pannarello wand that takes the guesswork out of frothing milk, you’ll easily be able to top of your coffee with perfect frothed or steamed milk in seconds. Not only will the Logic brew great tasting espresso with ease, it also has sleek silver housing with black accents that will match beautifully with any décor.